Harry S. Truman has 1 media appearance. In Presidential Courage: Brave Leaders and How They Changed America 1789-1989, historian Michael Beschloss takes a look at nine crucial moments when a president risked his political career for the good of the country, often by taking an unpopular or controversial stand. In reviewing strong presidential stands — from George Washington's then-controversial peacemaking with England to Harry Truman's decision to recognize the newly formed state of Israel — the author drew on newly released material including presidential diaries, notes, and Oval Offfice recordings; he also reviewed interviews taped with former presidents once they'd left office. He concludes that while they all ultimately made courageous choices, "none of them was a saint; all of them wanted at times to do the wrong thing, to escape what might be political suicide." Harry S. Truman has a Legacy Library. Legacy libraries are the personal libraries of famous readers, entered by LibraryThing members from the Legacy Libraries group. » Harry S. Truman's legacy profile. » Harry S. Truman's profile. » Harry S. Truman's catalog. Harry S. Truman is currently considered a "single author." If one or more works are by a distinct, homonymous authors, go ahead and split the author. 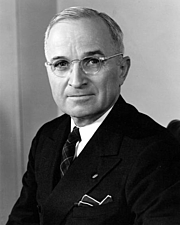 Harry S. Truman is composed of 6 names. You can examine and separate out names.